Our qualified plumbers at NC Plumbing Services are skilled at helping you through the toughest of clogs, including drain machine services. How do you know when it’s time for a rooter to clear your clog? The first clue may be that your drain is clogged. But you may experience other tell-tail signs of a drain problem, like odd back-ups in your drains. Do you run the dishwasher and the toilet gurgles? Will a load of wash cause a bubble-up in your shower stall? Multiple clogs and/or displaced water could be a sign of root problems in your drain. You’ve noticed your drain is moving slow, or worse yet, that your toilet is moving slow or backing up. You’ve tried plunging out the drain. You’ve tried a chemical solution. You may have even tried unraveling a wire coat hanger and fishing around yourself. If none of these methods clear your drain, you may benefit from drain machine service. 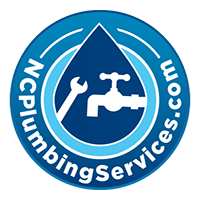 Our qualified plumbers at NC Plumbing Services will diagnose your clogged drain and recommend the best course of action. Using a drain machine doesn’t necessarily mean you have roots in your drain or pipes, but it can be an effective way to clear multiple back-ups and get you home draining properly again.